Behavioural economics is the study of the influence of psychological and behavioural factors on human decision making. This includes social, cognitive, contextual and emotional variables. Behavioural economics indicates that cognitive biases (e.g. confirmation bias) and rules of thumb (heuristics) often lead people to make what appear to be irrational and sub-optimal decisions from an economic perspective. 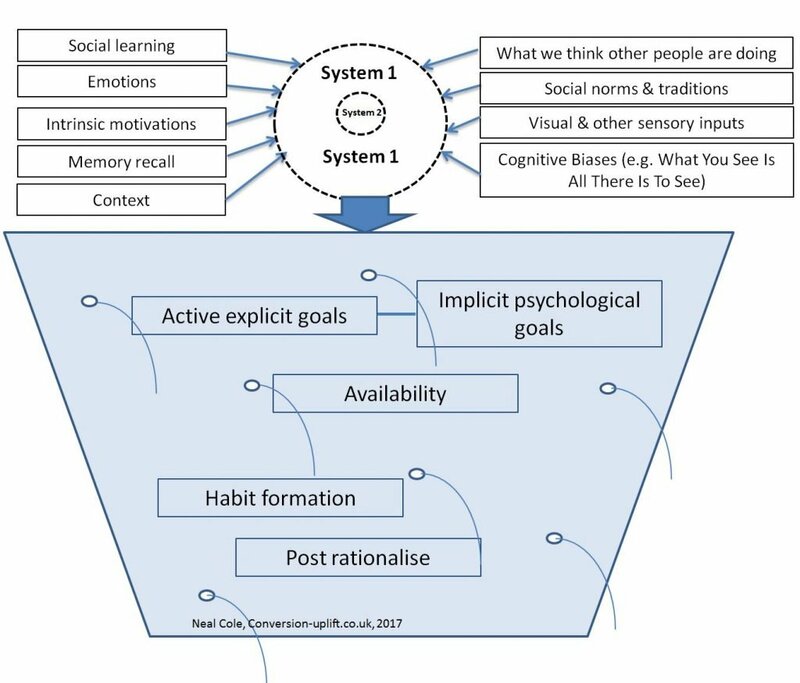 A majority of our decisions are made by our fast, intuitive brain, without any conscious thought (see System 1). This means that research that is dependent upon self-reporting is often flawed. People don’t have fixed preferences. Social norms and traditions often cause people to conform to expected behaviour. Brands must help customers achieve both explicit and implicit (psychological) goals to be perceived to be relevant and worthy of purchasing. Humans are often satisfiers rather than wanting to maximise utility. People don’t have the time or energy to seek to maximise utility. This means that companies that claim to be offering the “perfect” or “ideal” solution are not aligned to the real world and may well alienate consumers who want to deal with companies they can trust. Context of decision making is very important. Emotions often override logical thought as evolution has moulded our behaviour to respond to threats and to be wary of anything out of the ordinary. From studying behavioural economics I have created the conversion bucket below. This challenges conventional thinking of the decision making process being a sequential funnel. The evidence shows that decision making is not a linear process and people will go back and forward towards a decision depending upon many factors. Context, emotions and our herd instinct are at the heart of our decision making. Brands are what we do with them in the context of other people. The stories we tell each other about brands create the brand values, not the brand guidelines. Brands and marketing content are irrelevant on their own, without customers there is no brand. Cognitive bias – Why do people prefer to follow gut instinct rather than the evidence? Social influence – Are most purchase decisions the result of social influence? Applications for behavioural economics – Does MarComs signal the death of Marketing? Social influence – How do social networks influence human behaviour? Cognitive biases – How to use psychological triggers to boost conversion.